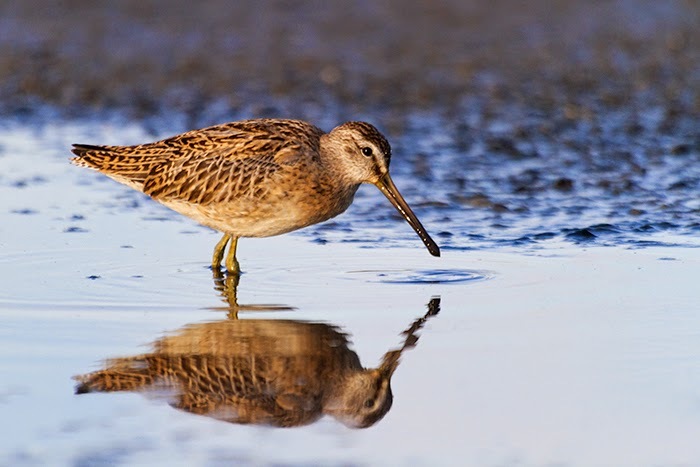 A Short-billed Dowitcher feeds in the mud at Jamaica Bay National Wildlife Refuge in Queens, NY. Wildlife photographers are often running around from spot to spot. Looking for the best light, the best animals, the best opportunities. We are loathe to stay in a spot that is temporarily unproductive, because we feel we are likely missing some "great" opportunity elsewhere while we sit looking at nothing or distant animals. Unfortunately, this instinct might be the worse thing for getting "great" photographs and for having quality experiences. Often with animals, especially if you are not photographing with a "super mega" telephoto, the best strategy is to find a likely spot and patiently let the animals come to you. Get down as low as you can, be as still as you can, and let the animals work their way towards you. Depending on the animal, you don't often have to hide or disguise yourself, just sitting still and patiently is enough. The animal knows you are there, they just have accepted that you are not a threat. This can take a lot of patience. Our first instinct when the animal comes close might be to reach up and start firing away with our motor drive, but that is often a good way to flush the animal right away. Often it is best to let the animal become comfortable with your presence, before you even begin to shoot. Try not to make direct eye contact, particularly when you are moving. Will this sometimes mean that you miss your shot? Sure, but more often the patience pays off with even better opportunities. For the image above, I laid (literally) out on a mudflat with my tripod at its lowest possible configuration for hours. I found a likely spot, and even though there wasn't any birds there when I got there, I stayed and let the foraging shorebirds come to me. I got lots of fabulous images this day. The birds were flushed by hawks three times while I was there, but by patiently waiting, the birds came back and often closer than before. By the end, I had peeps feeding on the mudflat less than 2-3 ft in front of me. This is one of the benefits of this method. In addition to getting some great images, you begin to feel like an accepted part of the landscape, rather than an intruder on it.